For thousands of years, the South West coastline has been a deeply spiritual place. Cornwall in particular is notable for its spiritual heritage and is awash with Saints, mostly Celtic, reflected in the many places named after them from St Agnes to St Ives. Today the county celebrated its patron Saint, St Piran, thought to have come from Ireland in the 5th or 6th Century on his Mill stone who landed at Perranporth where he set up a church. It’s a common feature along the Coast Path to find a parish church built on a promontory. As well as serving the spiritual needs of the parish, they would also offer places of refuge. The tall towers could be seen by incoming trade and fishing fleets. There’s little wonder why Cornwall has so many places of worship on the coast since the entire history of its people is inextricably linked to its proximity to the sea. Some of the most profound churches are often in the most remote and rugged parts of the coastline. St Helen’s Oratory at Cape Cornwall is one such example that has had continuous church occupation since the late Roman period. A favourite for many is the iconic St Michael’s Mount with its 14th century priory church. Stepping off the train in Penzance, it’s easy to follow in the footsteps of travellers old and new by joining St Michael’s Way, an ancient route that led pilgrims to Santiago de Compostela in North West Spain. 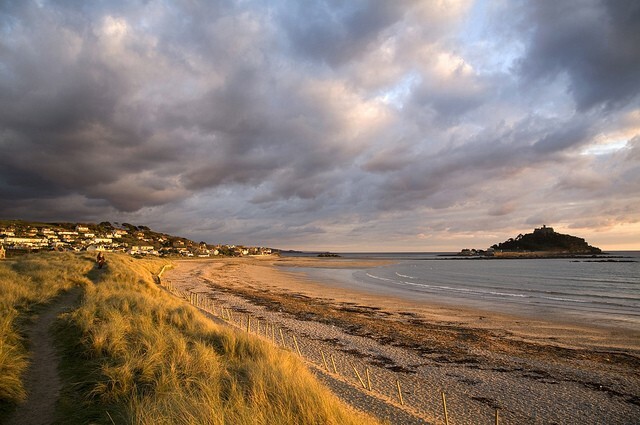 It now forms part of the South West Coast Path, which, alongside the likes of the Camino de Santiago, is considered one of Europe’s great walks and with such stunning views of Mount’s Bay and beyond, it’s easy to see why. Here’s a short walk from Penzance to Marazion where you can cross the causeway at low tide to visit the Mount.